Book stolen by notorious Nazi leader from French Jew during World War II soon goes up for public auction. In recent days, an antique Bible has been discovered that has been through many travels: from the library of a French Jewish doctor, to the notorious Nazi leader Hermann Goering, who loved Jewish art treasures, to a French Division Red Cross chaplain, and to the Jews of London. The Bible will soon be sold at the Kedem auction house in Jerusalem. 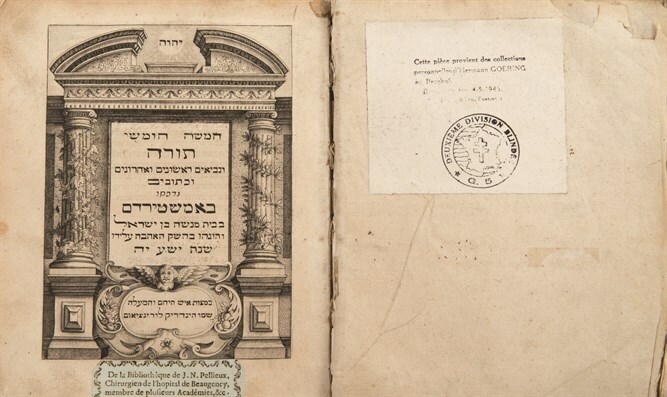 As the ex libris, the paper is affixed to the title page, testifies, the book was confiscated by the Nazis from the library of a Jewish doctor from France. The second piece of paper affixed to the title page is the one that tells the moving story of the book. "The item was taken from Goering's private collections in Berghof, in the area of ​​Berchtesgaden." Under the caption appears the stamp of the French Division of the Red Cross. Hermann Wilhelm Goering was a leader of the Nazi regime, commander of the Luftwaffe, the Wehrmacht's air arm, and the German Aviation Ministry. He played a crucial role in the persecution of Jews before their physical extermination in the Holocaust, the confiscation of their property, and the Kristallnacht pogroms. He was the highest-ranking Nazi war criminal who was caught alive at the end of the war and sentenced to death in the Nuremberg Trials, but committed suicide by swallowing a cyanide capsule before his death sentence could be carried out. Goering was known for his hedonistic and flamboyant way of life, which included the looting of art treasures from all over occupied Europe, to add to his private collections and to decorate his estates. The discovered Bible is one of the many items that Goering hoarded greedily for himself. The Obersalzberg region was badly bombed from the air during the war, and some of the bombings also caused serious damage to "Berghof." On May 4, 1945, after Hitler's suicide, retreating SS soldiers set fire to the ruins of the building, and the Allied soldiers who occupied the compound looted what remained of it. In 2005, the book was returned to Jewish hands when it was granted to Mr. Rosenfeld from London by the priest of the French Division who broke into Goering's home. Meron Aran, one of the owners of the Kedem auction house, notes that "this is a historical item of exceptional value that we have received. We hope that the Bible will reach one of the largest Holocaust museums, as happened in the past with important items sold by Kedem, such as the flag of the ‘Exodus’ ship donated to the Holocaust Museum in Washington, so that it will be presented to the wider public as a symbol and sign of the people who survived the most terrible inferno and moved forward with all their might. "